Atlanta, GA – November 28, 2017 – InComm, a leading prepaid product and payments technology company, today announced the launch of its general purpose reloadable (GPR) card program, MyVanilla Prepaid Mastercard and MyVanilla Prepaid Visa Cards, on select mobile wallets. These applications will allow consumers to make payments with their MyVanilla Cards conveniently with a touch of their phones just in time for the busy holiday shopping season. With this launch, MyVanilla customers in the U.S. will be able to use select mobile wallets to pay for purchases where contactless payments are accepted. MyVanilla Prepaid Mastercard customers will be able to load their cards onto Apple Pay and Samsung Pay. MyVanilla Prepaid Visa Card customers will be able to load their cards onto Apple Pay, Samsung Pay and Android Pay. The mobile wallet platforms use a token service to ensure transaction security. Each transaction is authorized with a one-time unique dynamic security code. Customers will have access to advanced wallet-based security and authentication systems to approve payments. Retailers are widely accepting them. They can be used for online shopping. Loyalty programs can be stored on them. They may soon make checkouts faster. MyVanilla is an alternative money management tool, available across the U.S. It only requires a quick and simple registration process with no credit check, as it is not a credit card. It can be used in store, online or in app. 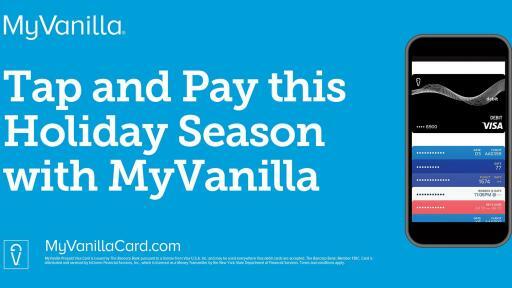 For more information about MyVanilla, visit www.MyVanillaCard.com. The MyVanilla Prepaid Mastercard is issued by The Bancorp Bank pursuant to license by Mastercard International Incorporated and may be used everywhere Debit Mastercard is accepted. The Bancorp Bank; Member FDIC. Mastercard is a registered trademark, and the circles design is a trademark of Mastercard International Incorporated. The Card is distributed and serviced by InComm Financial Services, Inc., which is licensed as a Money Transmitter by the New York State Department of Financial Services. Visa is a registered trademark of Visa International Service Association. The MyVanilla Prepaid Visa Card is issued by The Bancorp Bank pursuant to a license from Visa U.S.A. Inc. and can be used wherever Visa debit cards are accepted. Terms and Conditions apply – see Cardholder Agreement for details. Samsung Pay and the Samsung Pay Logo are a registered trademark of Samsung. Apple Pay and the Apple Logo are trademarks of Apple Inc.